Please ensure that you have timesheets approved and are waiting to be exported, and that your employees have valid timesheet export codes. Please note that the employee export code cannot exceed 5 characters. 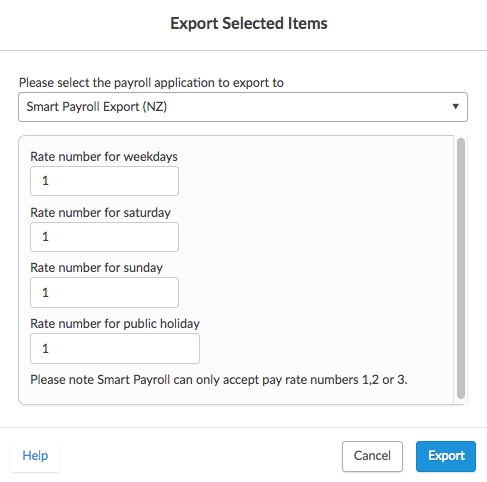 In the payroll application drop-down list, select 'Smart Payroll Export (NZ). Smart Payroll can only accept pay rate numbers 1, 2, or 3. The file should look similar to the image below and is used to upload to Smart Payroll to complete your payroll process.